In this Impact Case Dog Crate review, we take a look at these US made virtually indestructible and inescapable dog crates. And we’ll let you know exactly what they have to offer for your investment. As you probably already know – perhaps through experience, wire crates are great for small young puppies and housebroken adult dogs. But if you have an untrained dog, it’s a whole different story. This especially the case if they are a smart escape artist that figures out how to exploit cage security weaknesses to escape. Or if they are a powerful dog that simply escapes through brute force. If a Houdini or a gorilla strength canine wants out, they’re going to make short work of wire or weak crates. For these pets, we need a crate that is strong, sturdy, and secure to prevent destruction and escape. 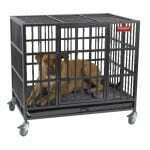 This is a crate that gets the job done for securely containing virtually all dogs. It’s also a must if you like to travel a lot on the road or by air. The Stationary model meets the more stringent IATA CR82 air travel requirements for fighting or dangerous dog breeds. It’s also lightweight for portability. The collapsible model is also great for space saving when not in use. The Impact Dog Crates are made in the US by Impact Case & Container from where the crate name and Impact Dog Crates brand name derives. You may have also seen them under the brand name Kennect Pet or Impact Case & Container. They also appear under the Grain Valley brand. The high end dog collapsible and stationary crates come with a number of features that will be welcomed by dog owners looking for crate portability, space saving, or the possibility of pet travel. Difference Between Collapsible And Stationary Impact Dog Crates – Which One Should You Choose? Where To Buy The Impact Case And Container Dog Crate? The main difference between the Impact Case Collapsible Dog Crate And Impact Case Stationary Dog Crate like the name suggests is whether your primary need is to recover storage space and have easy portability. 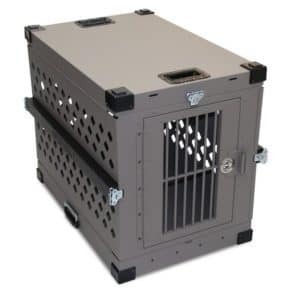 With the collapsible crate, while it is possible to move the kennel in its expanded state, you can more easily move it around in its briefcase style compacted state. If you would like to recover otherwise occupied space when the crate is not in use, you get that benefit too. The main benefit of the stationary crate is that it’s a bit cheaper due to the simpler and less costly manufacturing process. And because it’s non-collapsible, you get a crate with a solid frame, making it a bit more robust. That’s not to say that the collapsible crate is weak, as the collapsible fold on the sides of the collapsible crate are reinforced by latched metal bars when the cage is set up. These bars also serve as airline rails, should you decide to fly with your pet. These airline rails help the crate to meet the IATA requirements for pet air travel if you should need to fly with your pet. The stationary crate also comes with airline rails, and it has the additional benefit of meeting the stricter IATA CR 82 requirements, which means the stationary crate is also suitable for travel with “dangerous” dogs. Another benefit with the collapsible crate for anyone that hates putting something together is that it is very simple and there’s not a single screw that needs screwing in, nor the need for any bolts and wrenches. You pretty much just lift up the top of the crate, then pull out and latch the front door and rear panel, and finally secure the folding/collapsible section on the sides of the crate with the metal airline rails. The stationary crate requires a little bit of DIY. The clean, no nonsense design of both Impact dog cages is aimed to ensure your dog stays safe and stays secure. The look and design of both crates is the same aside from the collapsible features built into the Impact Case Collapsible Dog Crate. It really is that simple, and should only take you a minute. Check out the video. With the stationery crate, some assembly is required. The sides all need to be connected and secured with screws and bolts. It’s not too painful though. You should be done in 10-20 minutes and you’ll only have to do it once. Here’s a video showing you how to do it. So let’s take a closer look at what these crates have to offer and why they are recommended over many over crates in the heavy duty escape proof dog crate category. One of the biggest issues when it comes to large and/or powerful dogs is the determination of some of them not to be left in a crate. If the cage is too weak or not very secure, your Houdini dog will escape the crate by force or by cunning and persistence. Of course your dog should not be left alone locked in a crate anyway without undergoing crate training. Lack of crate training tends to create feelings of anxiety and abandonment for your pet. While you may want an Alcatraz dog crate for your pet, your pet needs to feel comfortable, not anxious when they are secured in their crate. A design that helps them avoid causing harm to his or her self is a good consideration. The design of this escape proof dog crate has safety and security in mind. There are no bars wide enough on this Impact dog crate for your dog to try to get his/her teeth or paws around. The problem with many heavy duty crates lies with the bar design. Not a problem with this crate, it’ll be a lot more difficult for your pet to wrap teeth around the thin bars on this cage. A determined dog that can grip and pull at bars may also be powerful enough to bend or worse break away the bars if the cage isn’t strong enough. The lack of bars in the impact dog crate removes what for some cages is a serious vulnerability through which a powerful and determined dog can find a means of escape. However that is not to say bar crates don’t work. A large number of buyers found the ProSelect Empire heavy duty dog crate to be perfectly adequate for example. With some other crates your dog wouldn’t even need to go to the effort of attacking bars to get out, as they are locked with poor quality latches that are within the reach of a smart dog’s paws or even jaws. He’s watched and learned how you unlock the crate, and he’ll exploit or attack the latch and get out. Neither scenario is a possibility with the Impact Case Collapsible and Stationary Dog Crates available in large and extra large sizes. Its neat and compact box design has holes in the sides and rear of the crate with a flat top and bottom. The front of the cage does have bars but they are so narrow that your dog will not be wrapping their jaws or their paws around them. So the case is well ventilated and its more sheltered design with rounded square vent holes around the rear and sides may also help your dog feel more relaxed like she or he is in a private den, but having the feel that they still have a direct line of sight. While we’re busy bestowing all those virtues of this crate, one other fantastic feature that is lacking from most heavy duty crates hasn’t even been talked about yet – this large collapsible dog crate by Impact Case and Container is fully portable due to its ability to collapse. So if you need to recover some space when your crate is not in use, this provides it. It can be quickly and tidily broken down into a briefcase or suitcase like design that is only eight inches tall and includes a carry handle. So no need to worry about having a crate permanently fixed in one place, taking up valuable space when not in use. Both the collapsible and stationary crates are also fairly lightweight and can be carried easily carried in their assembled state. As such, these crates are great for travel or simply letting your dog get some fresh air outside, while keeping him or her securely contained and out of mischief. Or to allow him to do so after an exercise period. Yes you read that right, this crate is suitable for flying with your pet. The Impact Case dog crates in both Collapsible and Stationary versions are IATA compliant and they come with airline rails. If you are not familiar with what IATA is, many airlines have requirements for traveling with your pet. However, note that In the case of large, powerful or aggressive dog breeds, IATA extend their standard requirements further with additional requirements that are even more stringent. These enhanced requirements are known as IATA 82 or IATA CR 82. The Impact Stationary Dog Crate is an IATA 82 Dog Crate, as it meets those requirements. If you’re looking for a pitbull dog crate that is compliant, this is it. However this is not the case with the collapsible model. Even though the airline rails provide stability to the collapsible crate, it is nevertheless due to being a collapsible crate, officially classed as only IATA compliant, not IATA CR 82. So with both versions of the crate you can easily and securely take your pet with you while driving, and in the case of the stationary crate, you can easily take her with you on flight trips too. However do be aware that you also need to check your proposed airline’s requirements before you book your ticket, as airlines can and do set their own additional requirements on top of those specified by the IATA. The Impact Case Collapsible Dog Crate is made using high quality .063 light weight, corrosion resistant, yet heavy duty aluminum. This makes for a strong, sturdy, robust crate that is also 20% lighter than some other “heavy duty” crates. It also has a marine grade slim latch and hardware. This ensures your pet is not getting out until you let him out. The latch automatically locks into place giving you a hassle free close. The crates large vent holes and front door design ensure adequate airflow to the crate. The cage’s tan powder coated finish on the inside and outside also helps to reflect heat away from your pet. It also has composite corners that provide impact protection. And if you have more than one dog that you would like to secure, well this crate is designed to be stackable, so you can buy two and secure both of your pets side by side or in a stack. If you want one of the best dog crates in its class, this Impact Case And Container Dog Crate is it. Impact Case have designed a tough aluminum heavy duty dog crate, that is also lightweight, portable, and suitable for travel. And that concludes our Impact Case dog crate review, thanks for reading.